Enumall is a Python-based tool that helps you do subdomain discovery using only one command by combining the abilities of Recon-ng and AltDNS. This gives you the ability to run multiple domains within the same session. The tool only has one module that needs an API key (/api/google_site) find instructions for that on the recon-ng wiki. Create the config.py file and specify the path to Recon-ng and AltDNS as it showed in config_sample.py. 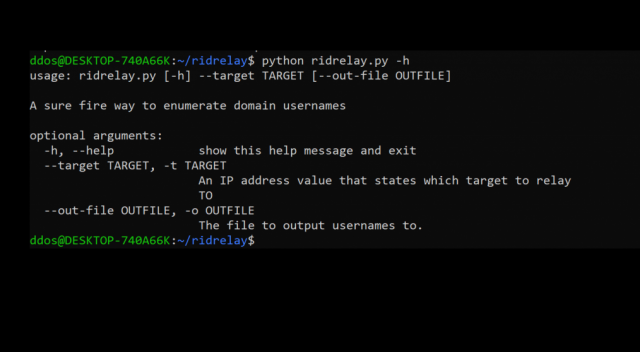 RidRelay is a Python-based tool to enumerate usernames on a domain where you have no credentials by using a SMB Relay Attack with low privileges. For best results, use with Responder. First, find a target host to relay to. The target must be a member of the domain and MUST have SMB Signin off. CrackMapExec can get this info for you very quick! NetBScanner is a NetBIOS network scanner tool that scans all computers in the IP addresses range you choose, using the NetBIOS protocol. Network adapter manufacturer (from MAC address). NetBScanner also shows whether a computer is a Master Browser. You can easily select one or more computers found by NetBScanner, and then export the list into csv/tab-delimited/xml/html file. After you choose the desired scan option, click the ‘Ok’ button, and then NetBScanner will start scanning your network. /scan	Start to scan immediately on start. /ScanSpeed <Speed>	Specifies the scanning speed. The speed is a number between 0 and 100.